SAN DIEGO—Life-changing accidents can happen in the blink of an eye. That I know well: I’ve torn up both knees badly through on-board falls, requiring surgery. But I had the luxury of recovering and rehabbing my knees while living on land without worrying about dock ramps and ladders. What happens if you live aboard and your recovery takes place in a full-time on-board environment? 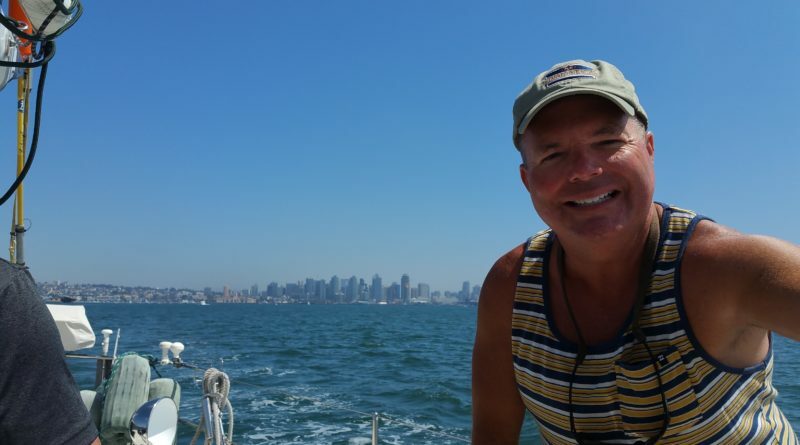 Tim Golberg, my dockmate at Sunroad Resort Marina, has lived aboard for 15 years, first in the Washington, D.C. area and now in San Diego. For over five years he’s lived aboard a multi-level 50-foot Sea Ray with his partner, now husband, of 23 years, who works long hours. Golberg is a seasoned airline flight attendant, accustomed to long hours on his feet and navigating turbulent waters and flights. He was working a short hop flight from Los Angeles to Las Vegas when the plane encountered severe turbulence. “It never occurred to me I could be injured. It came out of the blue,” Golberg said. Unable to put much weight on his knee, he limped in pain back to his base in Phoenix and then home to his boat in San Diego. He knew he was in trouble physically, especially when he found himself caught in the endless limbo of the worker’s comp medical system. “I was panicked. My biggest fear was how was I going to take care of this boat,” which he washes and maintains himself, he explained. What was he to do? Golberg, who experienced great personal loss as a young man, is a remarkably upbeat, resourceful and resilient man who developed coping skills out of necessity. Impatiently working his way through the torturous medical insurance system after sluggish initial treatment, he eventually got the MRI and required knee surgery. But he couldn’t work for seven months. He had to figure out how to manage living on and caring for his beloved boat while securing the healthcare and other services he needed to survive. Rather than mope on the boat alone, he learned the value of communications. It’s important to explain to medical providers you live on a boat with accessibility issues and may need crutches or a cane to get around. “The biggest lesson is you have to reach out to people,” and ask for help, he explained. He discovered that friends, family, and dockmates are happy to assist when they know you need help. He bartered services with neighbors, including sitting on a neighbor’s boat awaiting a mechanic in exchange for picking up laundry, or exchanging shoe polishing for vacuuming. He advises locating services like local drug and grocery stores and restaurants that provide delivery to your boat, to stay well supplied and nourished. Most important, he said, remain engaged and don’t brood. Work at your physical therapy, if appropriate, but also keep your mind occupied. He borrowed books from friends and family. And he praised the Sunroad Marina staff for their ever-cheerful, ready assistance. Now happily back at his flight attendant career, Golberg has managed to turn lemons into lemonade.